The new Bosch GKF125CE Colt palm router has earned the title of “longest tool tease,” at least as far as handheld woodworking tools go. We first wrote about it 2 YEARS ago, after a reader caught sight of a Lowes.com product listing. A new listing popped up a few months ago, but it was only today that Bosch officially announced it. So what happened? I’m guessing that it was an in-development product that Lowes’ datafeed somehow picked up on early, or something like that. It was surely delayed, and since it was only officially announced today, we probably won’t ever find out why. Since it’s been 2 years, and more information has been made available, it’s worth taking a new look at the router. You might think that corded palm routers aren’t very exciting, but I’ve been particularly eager to see this one launch. An ergonomic design and impressive power combine to deliver a tool that’s versatile, easy-to-use and precise. It features a 1.25 hp (MAX) 7.0A motor, and ergonomic and soft-grip design. Electronic features include variable-speed controls (16,000-35,000 RPM), soft-start circuitry for reduced start-up torque, and constant response circuitry to help maintain speed under load. 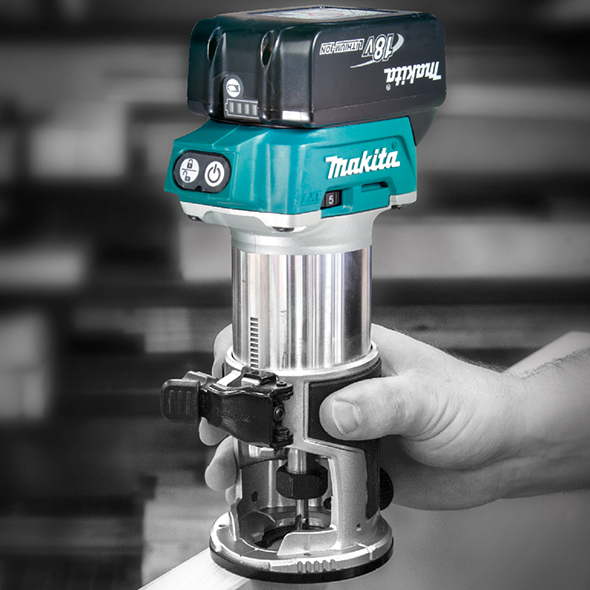 The 1/4″ router is bundled with a PR101 fixed-base housing which can accommodate bits up to 1-5/16″ wide. 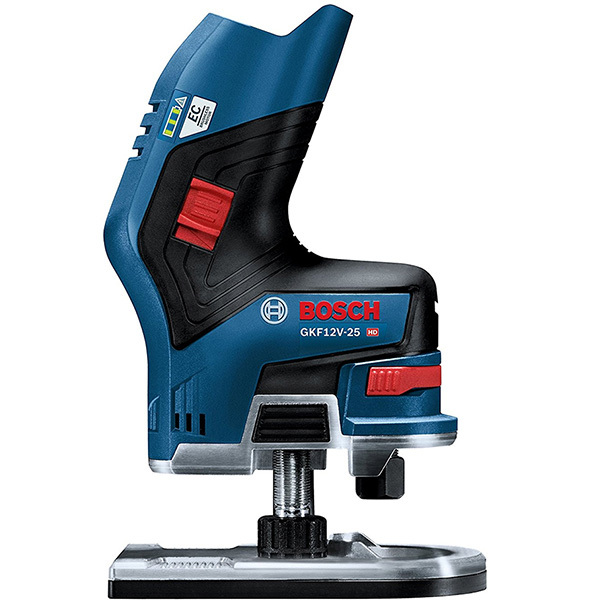 Bosch has confirmed that the previous generation Bosch Colt router bases will NOT work with the new GKF125CE router. An optional plunge base will be available in 2018. As hinted by the early product listing, there’s a user-friendly depth-adjustment system, and it has both inch and metric scales, for greater precision. There’s an LED work light. Additional features include a shaft lock and included collet wrench. The cord is fixed to the router using a ball-joint, allowing it to swivel for easier maneuvering of the cord. 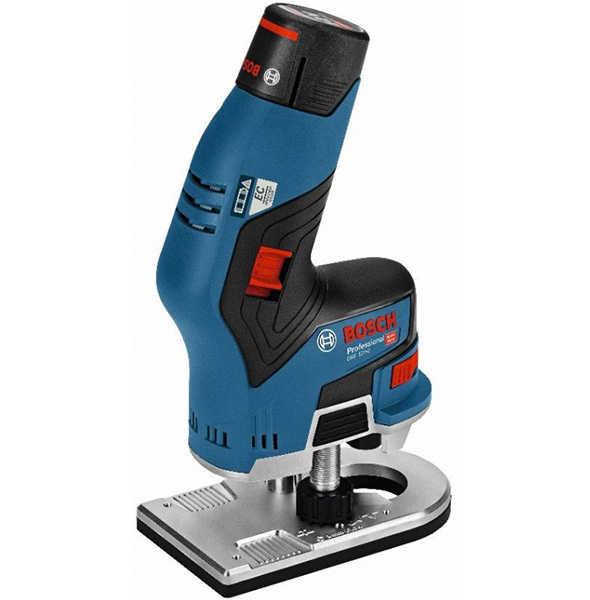 Bosch’s Colt router has been a hugely popular model, and for a long time. I find myself easily trusting that Bosch designed the GKF125CE to be a worthwhile upgrade. At the least, it’s more powerful. At best, it’s more powerful and has several years of ergonomics research contributing to superior user-friendliness. The previous/current generation model, PR20EVS, is rated at 1 hp and 5.6A, compared to the new one’s 1.25 hp and 7.0A motor rating. It’s less expensive though, at $99 for the router compared to the new one’s $129 price. There’s also an established accessories ecosystem supporting it. A plunge base for the GKF125CE will be out soon, and I anticipate that it won’t be long before its accessory lineup matches that of the PR20EVS. The best news, though, is that the router is REAL, and it’s coming out soon. The kit version includes a carrying case and straight-edge guide. Maybe the delay was due to Bosch wanting to launch a corded router that will be matched by a cordless one? Having to engineer the two with a common new base attachment system would have been a good reason to hold the corded one back, even if it was ready. That would be a good reason, and it would also award extra points to Bosch for a user-friendly approach. As for the new router itself, 2 years of anticipation leads me to simply trust that it’s an upgrade over the current model. The other thing is Bosch moves at a different speed compared to other tool companies. Bosch just releases tools at a slower pace. Nice looking unit , I like the soft start concept . The previous colt is so good, I’m a little skeptical that the new one is going to be anything but a slight increment better and not worth the upgrade for current colt owners. I’ve had mine for 10 years and love the ergonomics. It they would make it cordless, I’d be all in. completely agree. Previous Colt might well be most useful router ever. Only thing I wish for is a better depth adjustment system. Never felt the need for more power, that’s what my other routers are for. Nice router. I didn’t realize they were coming out with a new one or wouldn’t have just bought (like a month ago) the old style colt with plunge base from acmetools for $120 delivered. (great price) I agree with the above, soft start is nice and it would also be a must by if it gets delivered with some sort of micro adjust feature like their other newer generation routers have. Also, is that an LED light I see shining in the business end? That is something that missing on the old style colts.. The LED light on the bosch MR23 is on whenever the cord is plugged in. If they do that on the colt, that would be nice. It’s primary use is of course to light the working area but it’s a great reminder to unplug before swapping bits. I pretty happy with my Dewalt 611, it has the same power output, nice plunge base as well. The Bosch looks to now be about to be about equal to the Dewalt. Too bad the bases have not been announced yet. You would have thought that in 2 year’s time they could have gotten the whole package together. Before the Colt was released – Bosch sold the 1608 in one kit form with most (if not all) of its bases in a carrying case. It was a nice option if you needed the bundle. I’m very happy with my Dewalt 611. My next trim router will likely be cordless though. Not having the plunge base ready might be costly to those who want to get one later. It’s generally a much better deal to buy the kit with the plunge base. For instance I got the DW611 kit with plunge base in 2014 with a $20 off $100 holiday plus a lightning deal for $27. Total cost was $119. 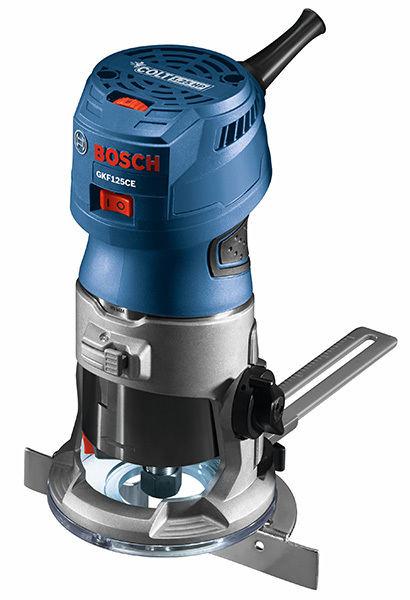 The DW611 is 7 amps and 1.25 hp, just like this new Bosch. The price on amazon for the kit right now is $176, but if you buy them separately, it is $202. I’ve rarely seen the plunge base go on sale, but the kits often do. I’ve seen this with other routers, too. I hope they have good dust control, too. The DW611 kit has two dust accessories (for fixed and plunge bases) that work extremely well. Bosch is one of my favorite corded brands, so I’m guessing they’ll have this good stuff for the new router at some point. But for now, the Dewalt kit outclasses them if you want a plunge base and good dust control. If their depth adjustment is something new and much better, it would put them ahead of the pack once these other accessories come online. Also the ease of removing the motor. The ball joint for the cord sounds excellent, too. I sometimes route circles with mine and it’s sooo annoying to have to unwind the cord all the time. My preference, but I’d rather have two wrenches than a collet wrench and a shaft lock. I pretty much hate the shaft locks. I don’t have strong hands anymore (just like many older woodworkers) and it’s really an annoyance. 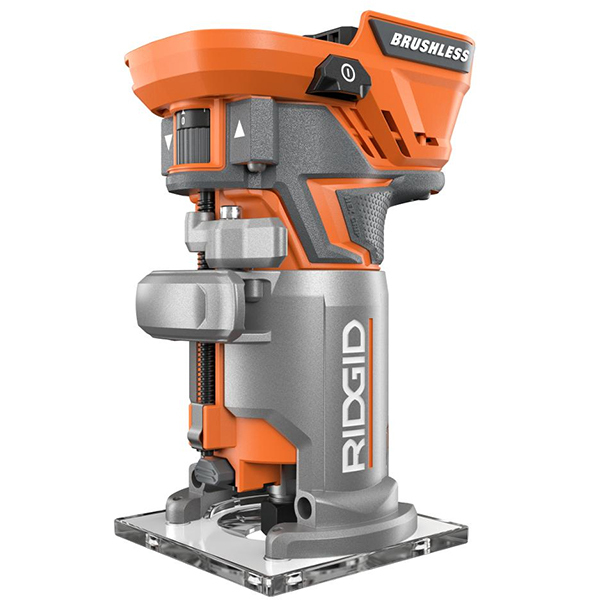 If you are just trimming a few cabinets or a kitchen/bath – then you might well prefer a cordless. If you are working in a cabinet shop – in production mode – then you might appreciate it having a cord. What we need is the lightweight, compact size, power and runtime of a corded trimmer without the annoyance of the cord. Too bad that no one has figured out how to transmit electrical power wirelessly. Where is Nikola Tesla when you need him? Actually, there are companies doing that right now. Both for cell phones (easy) and electric vehicles – buses, cars, forklifts, etc. Coupled power transfer and other forms of wireless power transfer are indeed making some headway. For some applications inductively coupled devices seem to work. My Breville electric teapot certainly works fine. Cars, busses etc. that can be in proximity to an under-the-pavement conductor and inductively couple to it to charge onboard batteries or even run motors may indeed be the wave of the future. Inductive battery chargers – like those from Bosch may be gaining in popularity. But the concept of an all enveloping electro-magnetic force field or directed beam that can be utilized to run a router motor – is not quite here yet. And, as we learn more about the potential deleterious health effects of sizeable and prolonged emf exposure – we may chose not implement the concept even it we can develop it. It’s still nice to dream. i have been following this for two years now..it is about time..still no listed accessories?? Well I purchased the simple router kit at Menards. Worked fine so I wanted to buy the plunge base. I called Bosch and they would not tell me who was carrying the plunge base, PR111. They would not tell me the SRP. I kept pursuing information and Klingspor had a kit including the plunge base for $199. I called them and was told it would be in stock on March 20, 2019. I asked about the base alone and was told it was a special order item for 99. So $139 for the simple kit and $99 for the plunge base. I decided to order the new kit and returned the other to Menards. I checked the Klingspor website and the new date they will get the combo kit is mid-July 2019. Sounds to me like Bosch wants to go out of business. That would be 4 years to get something released. By the time it gets released the technology will be completely outdated. A bit off topic – but Amazon has a great price on a 2.5HP Bosch Router Kit. I have a Roto Zip that takes 1/4″ router bits as well as the usual spiral drywall cutter. I don’t use it as such, mainly I just cut drywall with it. I find a full sized corded router easier to control for edge work. However mine came with all manner of attachments like Circle Cutter and routing guide like the Colt. I wouldn’t even own it but Lowe’s blew a pallet of them out for $25 each. It is one of my least-used tools. I wonder how this new Colt would compare to the Roto Zip. Also that photo at the top makes me nervous, the thumb and finger so close to the bit. I agree with the finger and thumb observation. The round base makes you move your digits a lot closer to the bit over the old square base. I’ve never felt comfortable using a router this way. If the bit catches and spins the router, your fingers could be toast, but it does really increase your control in some situations. I also don’t like the change to the round base because it means less contact area. when you are approaching the corner when you are edge routing. It’s hard enough to keep the router from rocking with a square base, a round base will be that much harder to keep from tipping. Lexan is cheap the emergency room and finger surgery is not. It is pretty easy to buy or craft a teardrop shaped offset router base with an outrigger knob to give you added stability when edge trimming. I should have mentioned that Woodhaven is a source for aftermarket router bases with offset or double handles. They make sizes to fit various trommers. I got the new colt router to cut mortises for a door latch. When I went to the store I had intended to look at the Makita (corded and cordless) and the dewalt. I didn’t even know that there was a new colt model out. The dewalt has many reviews of excellence and the Makita also, and this new colt is a bit of an unknown in that regard. 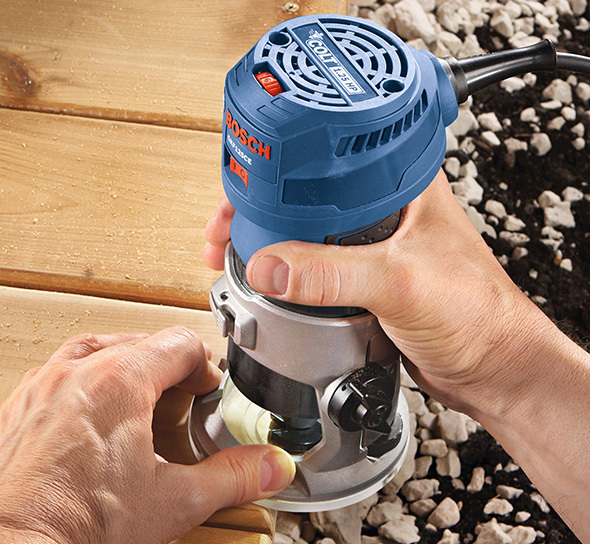 The Bosch had all the features of the dewalt, and the depth micro adjust felt more precise. The build quality appears excellent. I wanted to like the Makita more (build quality looks excellent), but no micro depth control, black base, and no leds were deal breakers. The clear base and leds are great. Seeing what I was doing was very helpful. The micro depth control was awesome. I had an epoxy repair I needed to remove and I was able to sneak right up on the depth I wanted. The weight of the router in a sideways orientation (door edge) was easy. Also, removing the base to change bits is very fast and convenient. a hard plastic case. I really like having the tool in a case. From the Bosch 2018/2019 paper catalog there is a kit with a plunge base (GFK125CEPK) but I don’t see it on the US Bosch website. Hopefully this will be on sale soon. The catalog also shows a base with a offset handle (RR007) that may address the concern some have for having fingers so close to the bit.